Search Engine Optimisation (SEO) is increasing the quantity and quality of traffic to your website through organic search engine results (traffic you don't have to pay for). Here's how it works: Google (or any search engine you're using) has a crawler that goes out and gathers information about all the content they can find on the Internet. The crawlers bring that information back to the search engine to build an index. That index is then fed through an algorithm that tries to match all that data with your query. There are a lot of factors that go into a search engine's algorithm, and it's a very complex area. To help you have some understanding of the reasoning behind our search engine optimisation strategies, you might find the following information helpful. Myth 1: The more search engines you submit to, the better. There are submission tools and services that claim to submit your website to anywhere between 300 to 20,000 search engines. In theory, this would be worthwhile – if only there were that many search engines! The reality is, most are merely “directory” websites that exchange links and offer little to no value to your business. In fact, Google warns against such sites (also known as Free for All or FFA sites) because they tend to be “bad neighbourhoods” and your site could be banned from a search engine. There are only three search engines that deserve attention – Google, Yahoo and Bing because between the three of them, Google in particular, they dominate the market. That is where the majority of your potential customers go to search for your product or service. Myth 2: Just add meta-tags and you will get ranked. Meta tags include a list of keywords that relate to your business that are inserted into the programming of your website and which search engines can reference. Until recently, meta tags were one of the only ways for search engines to rank your website. However, Google now uses very much more sophisticated methods of determining what your website is about and what sort of enquiries you want to match to and keyword meta tags do not have the influence they once did. Google will rank your website based largely on the relevance of your website's page content. That having been said, meta tags are still being used and should not be left out or ignored. It is important to cover all your bases, there is no ONE way to get to the top. Myth 3: You don’t need SEO because you rank high for your company name. Remember, you are trying to capture potential customers who have probably never heard of you, so unless your business is as well-known as Coca-Cola, just being found for your company name is not going to work for you. Discover the search terms customers use to look for your products and services, and then develop your content accordingly. This approach will help you attract new customers - not just customers who already know you. Myth 4: Good design negates functionality. The cruel irony is that some of the most expensive websites are invisible to search engines. Not long ago when websites became the must-have marketing tool, many web designers built attractive websites that came complete with bells and whistles, fancy images, flash animations and more. The problem is, some of these well designed sites would never rank high in search engines because the design simply cannot be read by search engines. Search engines can read only text, not pictures. So in the world of websites, a picture is worth less than a thousand words! However, good website designers can implement strategies to help your well designed website still function well within the search engine environment, combining excellent design together with functionality. This is most important and you should be aware that an attractive website can be a poor performer in search engine listings if your designer does not understand the balance between form and function. Further, you need to treat your website content like a good magazine editor would. Provide relevant and quality content and the search engines (as well as site visitors) will reward you with a high ranking. That means providing relevant, keyword-rich text. Myth 5: Your re-vamped or new website will immediately rank the moment it’s published. The nightmare scenario for any business is they decide to makeover their existing website and the new website ranks lower than the previous design. Or, it doesn't rank at all! (See myth 4). Either situation is very possible unless sound SEO principles are followed. Even after a website has been “repaired” or published for SEO, it takes months for the site to rank highly. Myth 6: SEO is a black art, only practised by IT experts. There is no doubt technical expertise is required to build and program websites. However, SEO is more than just changes to code in your website. It requires a detailed understanding of your business and your competitive environment. Further, as competition to achieve higher rankings heats up, you need a specialist who is up to date with best practice search engine strategies. There are strategies that you can be sure we will implement into construction of the website to help it achieve a high ranking in results. But there are also some things you can do to help us make this happen. Before you have your website built, test the search engines yourself by typing in words you think your customers might use when looking for your business. Check the results listing carefully, who is at the top, is it one of your major competitors, where do your competitors come within the listings. Check over the content of the websites at the top of the list and try to work out why they are positioned so well. Maybe you could implement some of their ideas within your own website. Consider your text content in detail. Plan to include descriptive text that repeats key words or phrases that you think your customers might use while using a search engine. Remember, the aim is to make a word match with the search criteria. You need to find a happy balance between acceptable repetition of important key words & phrases (for the search engines) and boring expanses of text (for your human visitors). Consider developing reciprocal links with other websites that are complimentary to your own. It's important to be seen as a relevant business. Websites that do not link to any other websites may not be considered important where websites that have inbound and outbound links could be judged as more popular. Search engine robots use inbound and outbound hyperlinks within websites to travel from one website to another, cataloguing the content of each site as they go. A website that exists on the internet without hyperlinks to any other website will not be easily found and catalogued. It is not enough just to link to other websites, it is vital that they also link to you. After the website has been created with sound SEO strategies in place, you need to give it a few months to see how your website performs in search results, it's unrealistic to expect overnight results. 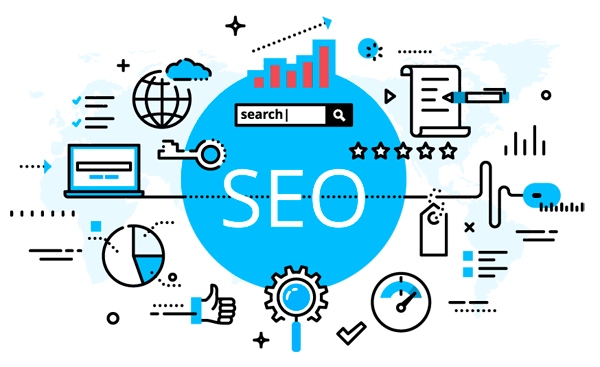 If after a while you find you need more help boosting your website's presesnce, you should do good research and inform yourself on current methods and services available from SEO companies. Google expressly warns against making guarantees and states that 'No-one can guarantee a #1 ranking on Google'... therefore we urge caution, there are thousands of articles to read and many companies making claims. Disclaimer: Planet Graphics do not make any claims with regards to expectations of results of any kind post publishing of your website. All advices given are general suggestions and should be used as a guide only. You should make up your own mind as to its relevance to your business. You should consult a lawyer if you would like to know about your legal responsibilities and obligations with respect to the content of your website.